Following our ‘Han Kitab’ series, a body of literature about Islam in classical Chinese written by Sinicized Muslim scholars ‘Rectifying God’s Name’ examines the life and work of one of the most important of the Qing Chinese Muslim literati, Liu Zhi (ca. 1660–ca. 1730), and places his writings in their historical, cultural, social, and religio-philosophical context. His ‘Tianfang danli (Ritual law of Islam)’ represents the most systematic and sophisticated attempt within the Han Kitab corpus to harmonize Islam with Chinese thought. The volume begins by situating Liu Zhi in the historical development of the Chinese Muslim intellectual tradition, examining his sources and influences as well as his legacy. Delving into the contents of Liu Zhi’s work, it focuses on his use of specific Chinese terms and concepts, their origins and meanings in Chinese thought, and their correspondence to Islamic principles. A close examination of the Tianfang dianli reveals Liu Zhi’s specific usage of the concept of Ritual as a common foundation of both Confucian morality and social order and Islamic piety. The challenge of expressing such concepts in a context devoid of any clear monotheistic principle tested the limits of his scholarship and linguistic finesse. Liu Zhi’s theological discussion in the Tianfang dianli engages not only the ancient Confucian tradition, but also Daoism, Buddhism, and even non-Chinese traditions. His methodology reveals an erudite and cosmopolitan scholar who synthesized diverse influences, from Sufism to Neo-Confucianism, and possibly even Jesuit and Jewish sources, into a body of work that was both steeped in tradition and, yet, exceedingly original, epitomizing the phenomenon of Chinese Muslim simultaneity. With the ever more importance of China on the global stage, and especially surrounded by a growing Muslim populace from both within and neighbouring nations, a serious study of these ‘Han Kitab’ texts could provide some insightful approaches to two very different but yet very similar cultures and civilisations. 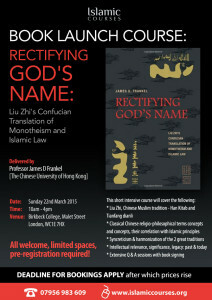 A compelling and multidimensional study, Rectifying God’s Name will be eagerly welcomed by interested readers of Chinese and Islamic religious and social history, as well as students and scholars of comparative religion. James D. Frankel, a native New Yorker, holds a Bachelor’s degree in East Asian Studies and postgraduate degrees in Religion from Columbia University. His expertise is in the history of Islam in China, and his scholarly interests emphasize the comparative history of ideas and religious and cultural syncretism. His doctoral dissertation is on the subject of Chinese Islamic scholarship and literature of the early Qing (1644 – 1911) period, specifically the writings of the Chinese Muslim literatus Liu Zhi (ca. 1660 – ca. 1730). 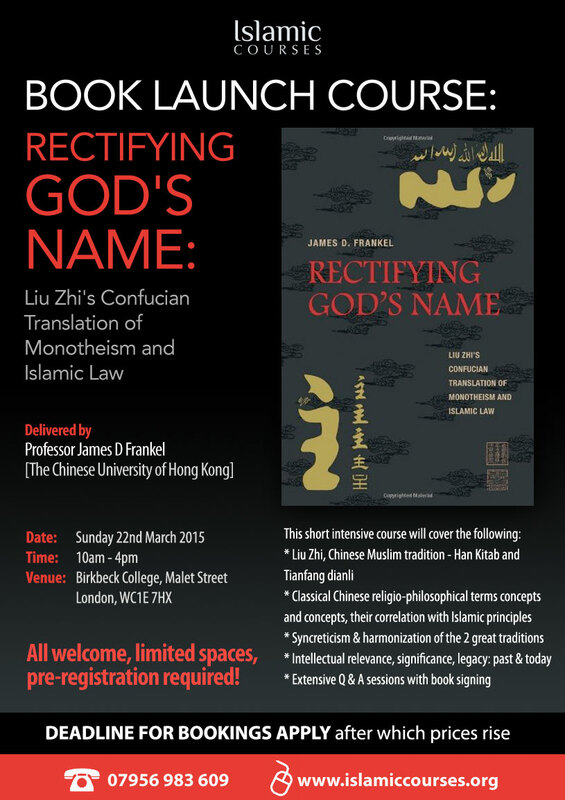 Expounding on the same topic, Dr. Frankel’s first book, Rectifying God’s Name: Liu Zhi’s Confucian Translation of Monotheism and Islamic Law, has recently been published by University of Hawaii Press (2011). He has lived in China and has traveled extensively in Asia and Europe, where he has met with scholars and religious leaders of Muslim minority communities. As a member of the faculty of Religion, Dr. Frankel teaches courses in Islam, comparative religion, Chinese religions, and mysticism.